New Years holiday parties usually include food. 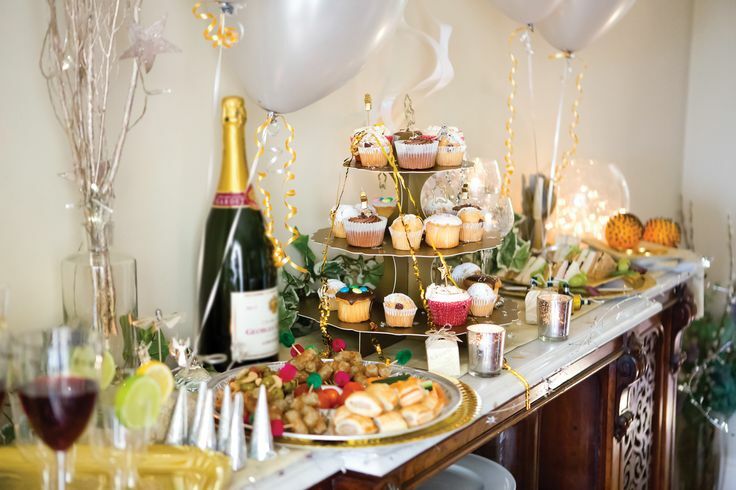 Laying food out on a buffet table is a popular way to serve food at these festive gatherings. But serving food this way can contribute to foodborne illnesses — a bad way to start the New Year! To protect your guests from foodborne illnesses, follow important food safety procedures and principles. A popular way to celebrate holidays or any party occasion is to cook a lot of food and invite friends and family. 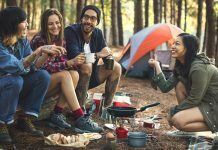 However, this type of food service – where foods are left out for long periods – leaves the door open for uninvited guests – bacteria that cause foodborne illness. Festive times for giving and sharing should not include sharing foodborne illness. Keep hands, kitchen, dishes and utensils clean. Wash your hands constantly during preparation, serving and cleanup. Keep your kitchen, dishes and utensils clean. Be sure your serving dishes are clean. Avoid Cross-Contamination. Separate raw meats from other foods to avoid cross-contamination. Also, do not serve food on plates that previously held raw meat or poultry. Keep perishable foods refrigerated. Keep all perishable foods chilled until serving time. 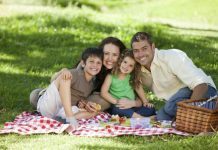 These include finger sandwiches, cheese platters, fruit or tossed salads, cold pasta dishes with meat, poultry, or seafood, and cream pies or cakes with whipped-cream and cream-cheese frostings. Hot foods should be held at 140°F or warmer. On the buffet table, keep hot foods hot with chafing dishes, warming trays or slow cookers. Keep the covers on the hot food dishes to keep the heat inside the dish. Cold food should be held at 40°F or colder. Keep foods cold by nesting dishes in bowls of ice. Otherwise, use smaller serving platters and replace them often. Use a food thermometer to make sure that food is at the correct temperatures. Serving Dishes. When serving foods on a buffet table, serve them in several small dishes or platters rather than on huge platters. When the dishes or platters are empty, replace them with clean dishes, rather than add fresh food to a used dish. 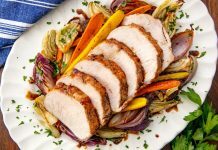 Leftover food safety – Use the 2-hour rule. Bacteria will multiply if you let foods sit out too long. Don’t leave perishable goodies out of the fridge for more than two hours (1 hour in temperatures above 90°F). Refrigerate or freeze leftovers within two hours of serving. If the leftover foods were on your buffet longer than two hours, throw them out. Eat your leftovers within three to four days. Use your freezer for longer storage. Reheat leftovers to 165°F. 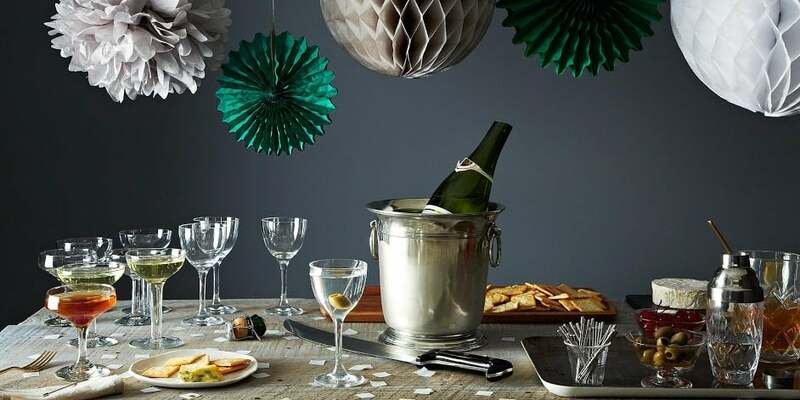 Clean up after your party. Use soap and water to wash the countertops, tables and the refrigerator door handle (one of the dirtiest spots in a busy kitchen). After washing and rinsing off the suds, follow up with a sanitizing solution of one teaspoon of bleach to one quart of water. Spray on the clean surfaces and air-dry. Bacteria multiply rapidly between 40°F and 140°F. 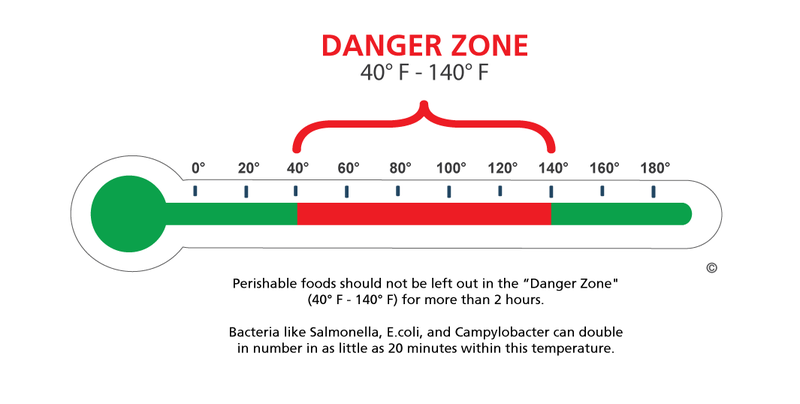 To keep food out of this “Danger Zone,” keep cold food cold and hot food hot. Keep food cold in the refrigerator, in coolers, or on the serving line on ice. Keep hot food in the oven, in heated chafing dishes, or in preheated steam tables, warming trays and/or slow cookers. Never leave perishable foods, such as meat, poultry, eggs and casseroles in the “Danger Zone” over 2 hours; 1 hour in temperatures above 90°F. Next articleProblem with your food? Know how to report it.